Michigan's coal mining industry spanned from 1860 to 1949 and produced over 46 million tons of coal. Mining conditions were difficult, because the state's coal deposits are highly variable in thickness and distribution and often drop out suddenly. All of Michigan's coal is bituminous in rank and averages 1-3 percent sulfur and 3-9 percent ash. In 2004, Michigan consumed over 35 million short tons of coal for electrical power to produce approximately 60 percent of its electricity. The state's average retail price of electricity is the 22nd highest in that nation at 8.14 cents per kilowatt hour. In 2003, Michigan emitted 185 million metric tons of carbon dioxide emissions, ranking it 9th in the nation overall. In May 2010 the Union of Concerned Scientists released a report titled, Burning Coal, Burning Cash: Ranking the States that Import the Most Coal. 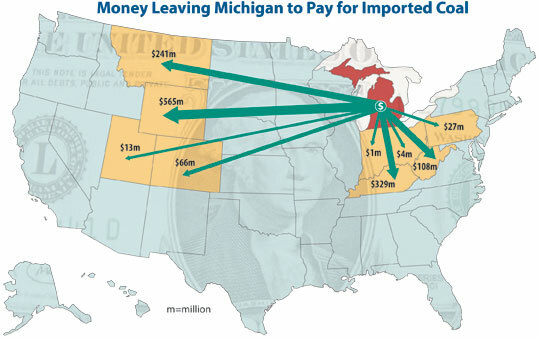 In the paper the group reported that Michigan was the seventh most coal dependent state in the country, spending $1.4 billion on coal imports in 2008. 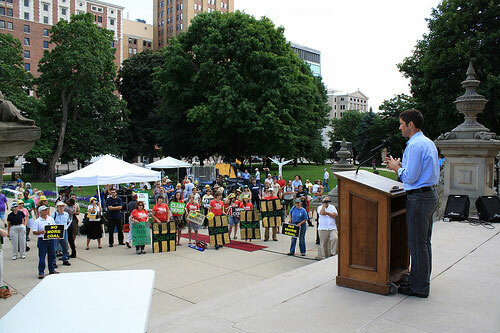 On July 29, 2009, Clean Energy Now, a coalition made up of over 40 environmentalist groups including Sierra Club, organized a Rally for Clean Energy Jobs to support Michigan’s clean energy future – and as a grassroots response to the proposal of new coal plants in Michigan. Recent coal activism in Michigan has centered on fighting new coal-fired plant proposals: Wolverine Power Cooperative’s Wolverine Clean Energy Venture, Mid-Michigan Energy’s Midland Power Plant, and Consumer Energy’s Karn/Weadock Generating Complex Expansion. 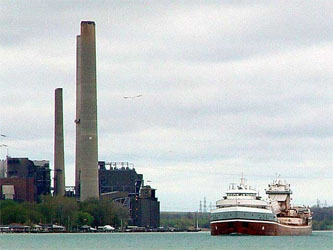 Tondu Corporation’s proposal for a new coal plant in Manistee was cancelled after the zoning permit was denied in 2004. One of the first citizen activist groups to spring up in response to Michigan's coal rush was Citizens for Environmental Inquiry. This group was formed in Northern Michigan in response to Wolverine Electrical Coop's announcement of plans for a large facility near Roger's City, in the northeastern lower peninsula. CEI quickly formed alliances with other groups throughout the state, and was an early aggressive player in filing a lawsuit against the Department of Environmental Quality to force the DEQ to follow the Supreme Court's directive to regulate CO2 as a pollutant. CEI has faced challenges in raising awareness locally because of the area’s depressed economic condition. Many citizens are convinced that a large coal facility is the only course to create jobs in the area. In response to economic concerns, CEI points to a study by Tom Sanzillo, senior analyst with T.R. Rose & Associates, a public policy consulting firm. "Michigan residents are looking at electricity from this plant that will approach 17-18 cents per kilowatt-hour" the study concluded, which is "more than double the current price." MidlandCARES is another Michigan activist group that was formed by a diverse group of professionals, including several in the health care sector, to fight a new coal plant proposed for the Midland area. 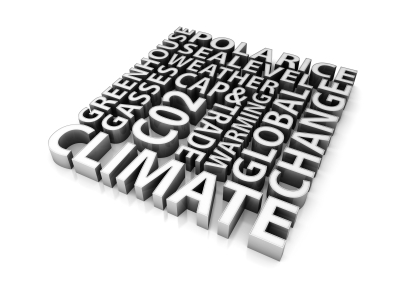 The group’s concerns include the environmental and health impacts of plant emissions, both locally and on global climate change. MidlandCARES members regularly attend and speak out at relevant city and county meetings to inform the community and create a documented record of opposition to the proposed plant. Alliances with the Sierra Club and National Resources Defense Council have provided legal and technical expertise to the group, and members have also formed links with activists in the Essexville area fighting the Karn/Weadock expansion project. On December 14, 2008, the Detroit Free Press carried an update from environmentalists Anne Woiwode and Cyndi Roper on the coal fight. Citizen groups and environmentalists are also battling the proposed use of petroleum coke at the new Wolverine plant. If the permit is approved, it will be the first approval of a predominantly pet-coke fired, utility-scale power plant in the state. Pet coke is a waste product from oil refineries. Although cheaper than coal, it has even more environmental problems, containing more toxic heavy metals, generating more toxic ash, and emitting more sulfur dioxide and nitrogen oxides, which cause a number of health and environmental problems. Yvonne White of NAACP speaks about River Rouge Power Plant. The River Rouge Power Plant located in the River Rouge Community of Southwest Detroit, Michigan, is surrounded by low income communities, primarily comprised of people of color, specifically African American and Latino. The plant is a mere two blocks from the start of one neighborhood and there is a park where people bring their families barbecue, and catch fish, a mere 500 feet from the smokestacks. Ms. Yvonne White, President of the Michigan State Conference of NAACP speaks about the power plant and the surrounding area. Michigan has a history as a coal mining state, and a number of abandoned coal mines are still evident in the mid-Michigan area. Michigan coal seams are thinner and more difficult to mine than in Appalachia, Wyoming, or other areas, so by the 1960's, Michigan's coal fields were abandoned. As the center of the Great Lake shipping lanes, Michigan is a cross roads for coal shipments from the fields of Appalachia in the east, and Wyoming in the West, to power plants and industrial sites from Buffalo and Cleveland to Chicago and Duluth. Michigan Governor Jennifer Granholm has expressed her goal for a Renewable Portfolio Standard of 25 percent, to help Michigan compete with the 26 other states that have ambitious RPS. In September 2008, the Michigan Senate passed a version of the energy legislation that included a 10 percent (by 2015) RPS standard, and sent it to governor. A controversial part of the legislation includes the concept of "deskewing" Michigan electrical rates, which would shift a portion of electricity costs from industry to residential consumers. Rate structures adopted during times when Michigan's industrial citizens were far more prosperous, had companies like General Motors paying a greater percentage of electrical costs. Now that Michigan manufacturing has fallen on hard times, there is a movement to shift power costs partially back on to consumers. Several citizen's groups, as well as Michigan's Attorney General, have opposed the move. In addition, the legislation will attempt to allocate charges for new renewable energy sources among different user groups, a process which is also controversial. In addition, some critics questioned several other features of the bill. The 10 percent RPS lags behind many state mandates,especially considering that Michigan already produces 4% of its power from renewables, primarily hydro. Environmental groups have also pointed out that the bill limits the amount of spending on energy efficiency, while placing no caps on coal or nuclear solutions. Early Press reports give some indication of the mixed reaction from groups around the state. While some business leaders expressed disatisfaction with the bills mandate for renewables, Muskegon Chamber of Commerce President, Cindy Larsen, said, "This is a great example of the 'Old Economy Meets the New Economy. There are people trying to hang on to the old economy which, we know, doesn't work anymore. We're trying to push the culture forward so we can really benefit from energy technology, which is a critical component of the new economy." The Detroit News, a conservative newspaper, expressed reservations about the potential costs of the measure, some of which are unrelated to the renewable portions of the bill. For instance, the News pointed out, "(the bill) would allow utility companies to overrun the cost of construction projects by 17.5 percent without returning to the public service commission for approval." The News also worried about "new energy bureaucracy that will insert itself into private homes and businesses." The Michigan Environmental Council has produced a summary of the bill's provisions. A first draft is available on line.. The following is the implementation schedule for the Renewable Standard. It divides the required MegaWatt capacity between the two major utilities, Consumers Energy, (CE) and DTE Energy (DTE). with renewable energy broken out on right. Michigan Renewable Energy Sources Act, House Bill 5218, would guarantee long-term, fixed prices for electricity generated from renewable sources. It was originally introduced by Michigan State Representative Kathleen Law and is based on German's "feed in tariff" (FIT) model to help increase renewable energy use. Ms. Law has since been term limited out of the legislature, but remains active in trying to get a Feed-In program enacted, by citizen initiative process. The experience of neighboring Ontario, where the the program has been vastly successful, has been an inspiration to those favoring the FIT. In Ontario, the government’s 10-year target cap of 1,000 megawatts was exceeded within a year. 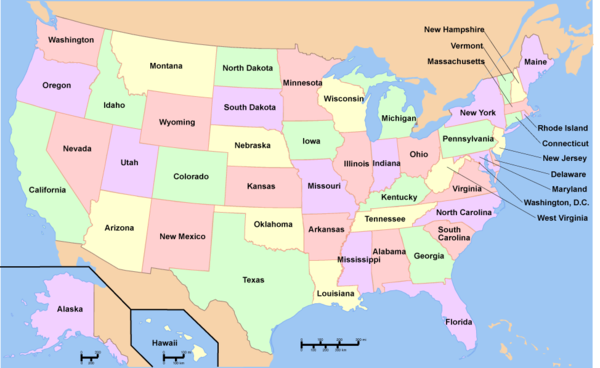 Feed In Tariffs are currently being considered in several states, including California. The National Renewable Energy Laboratory has released a studysuggesting that FITs can fit with Renewable Portfolio standards like Michigan's. The FIT has been re-introduced as a bill by State Rep. Lee Gonzales, D-Flint, as part of renewable energy legislation.“The idea behind the feed-in tariff is that any resident or business could be an energy entrepreneur,” said Gonzales. The proposal, which would aggressively promote installation of renewable energy devices by Michigan homeowners and businesses, was attackedin a "white paper" by a trade association representing Michigan electric co-ops. The association, the Michigan Electric Cooperative Association, provides public relations services for, among others, Wolverine Power Supply Cooperative Inc., which wants to build a 600 MW coal plant in Rogers City. On December 17, 2009, the Michigan state Senate passed legislation that would make it easier for utility companies to develop coal plants in the state. In a vote of 21-16, the Senate approved a bill that would prohibit the Michigan Department of Environmental Quality from considering whether a proposed power plant is needed and if so, whether there are alternative means of meeting the state's energy needs. The bill is also tied to measures that would privatize parts of the permit review process and prevent state agencies from instituting regulations that are more strict than federal regulations. The bill must be approved by the House. Environmental groups are urging the House to reject the bill. Anne Woiwode, director of the Sierra Club's Michigan Chapter, called the bill "a 'hail Mary' pass" by the Senate on behalf of the Michigan's large utility companies. Since 2003, cumulative real GDP growth in Michigan has ranked last among all states, declining by 3 percent. In 2006, former Michigan Public Service Commission Chairman, Peter Lark, authored a 21st Century Electric Energy Plan, which forcast a need for at least one new base load power plant by 2015 and one or two additional plants every year thereafter until 2025, the end of the projection period. Since then, Michigan's economy, even more than the nation, has contracted. Michigan is one of only two states that lost population in 2007. It has the highest unemployment rate in the country and the forecast is not optimistic because of Big 3 capacity downsizing. In January, 2009, Michigan's unemployment number hit 10.6%. In November, 2008, Consumer's Energy announced that electrical demand was down, but both Consumer's and LS Power re-affirmed their commitment to build power plants planned for Bay and Midland County. 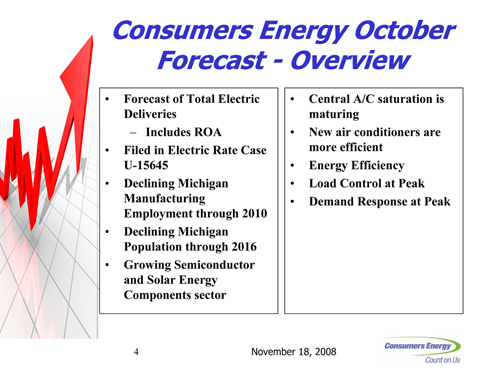 Now, both utilities have forcast that electrical demand will continue to decline, for a variety of reasons, including declining Michigan population through 2016, central A/C saturation is maturing, new air conditioners are more efficient, energy efficiency, load response and demand response at peak. DTE forecasts a 6% decline in peak demand from 2006 to 2013, and Consumer's Energy forcasts approximately 5% decline by 2018. In spite of these internal forcasts, both utilities continue to use the outdated 21st Century Energy plan as the basis for planning new Coal and Nuclear baseload plants. The downward trend is national. In November 2008, the Wall Street Journal reported that, nationwide, "An unexpected drop in U.S. electricity consumption has utility companies worried that the trend isn't a byproduct of the economic downturn, and could reflect a permanent shift in consumption that will require sweeping change in their industry." In August of 2009, The Journal reported that the trend is continuing, causing drops in electrical prices across the country. In August 2009, the Natural Resources Defense Council released a new report from Synapse Energy, a consulting firm, showing that Michigan can meet all of its energy needs " a combination of wind power, biomass, and other sources of renewable energy coupled with aggressive energy efficiency programs." 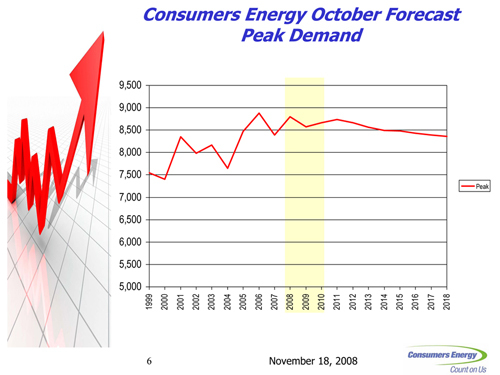 Consumer Energy internal forecasting now projects peak power demand will flatten and slowly fall in the coming ten years. Consumer's links the decline to a saturation of the Air Conditioning market, the increased efficiency of Air Conditioners and other appliances, and better load management practices on the part of the utility and consumers. In addition, Michigan's economic woes are a factor in the projections. The decline in power use is not unique to Consumer's or Michigan. The  Wall Street Journal has reported that across the country, utilities are experiencing a drop in electrical demand, that may not be related to the economic slowdown. Utility executives are being forced to take a hard look at expansion plans, as demand may be undergoing a historic adjustment. Consumer's Energy has announced that electric prices are likely to increase in response to new regulations on mercury and other pollutants. According to the Jackson Citizen Patriot, "The utility has 12 coal-fired units at its four complexes across the state. 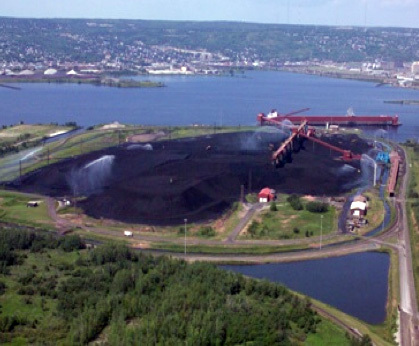 They burn about 10 million tons of coal annually, representing 70 percent of Consumers’ electricity. That amount of coal use creates 700 to 900 pounds of mercury." On July 2, 2009, We Energies filed a rate increase request with the Michigan Public Service Commission (PSC) to offset some of the $2.3 billion construction costs for its new Oak Creek Units 1 & 2. If approved by the PSC, Michigan customers could see their energy bills increase up to 33 percent. The average total monthly increase would be about $37 per customer. Michigan regulations require energy companies to wait until a new power plant is operating before raising rates. However, Wisconsin has already allowed WE to increase rates to offset construction costs. As a result, Wisconsin customers will not see the same dramatic increases once the plant is in service. 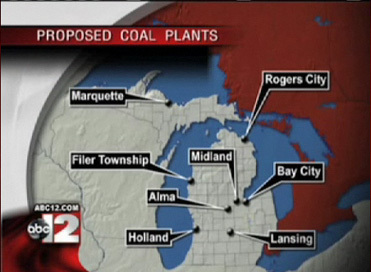 Early 2009 saw the emergence of Michigan's coal rush as a major media story across the state. The combination of President elect Obama's new energy initiatives, the Tennessee Coal ash disaster, and a successful display of Citizen action at the January 6 DEQ Air Quality hearings in relation to the Wolverine Clean Energy Venture boosted the issue into the headlines. The Detroit News, The Detroit Free Press, Associated Press, Lansing City Pulse, and Michigan Public Radio all picked up the story. In addition, several key TV stations ran original stories on the issue. In a major media development, the venerable, traditionally liberal Detroit Free Press has taken a significant position on the coal fight. The Free Press wrote, "The environmental groups have it right. Michigan ought to declare a moratorium on new coal-fired utility plants. This may even prove a blessing to the outfits that want the plants, given the difficulties of financing big projects these days." The paper noted that Michigan's energy demand was not sufficient to support the buildout that is contemplated. "Back when Michigan's economy was merely slipping, as opposed to cliff-diving, the most detailed forecast of future electricity demand called for just one new coal plant", as opposed to the 8 currently on the drawing boards. Waiting will very likely save rate payers from investing in projects that may have to be rethought, or canceled. "it seems reasonable to hold off on permits for coal plants for at least a year. That should provide a better picture on the financial markets, the demand for electricity and, perhaps most important, what kind of greenhouse gas regulations may emerge in Washington." The Free Press also fired another shot, with an Op-Ed piece written by two research physicians. Howard Hu, of the University of Michigan, and Kenneth Rosenman, from Michigan State University, described the environmental hazards of increased coal development, citing mercury as a "potent neurotoxin that affects brain development and is especially dangerous to children, infants, nursing mothers, and developing fetuses." They also linked particulate emissions to "numerous cardiopulmonary diseases and conditions including asthma, bronchitis, and chronic obstructive pulmonary disease, .... decreased lung function in children, heart attacks, lung inflammation, cancer, and premature deaths." The debate continued in the pages of the Detroit Free Press on January 30, when 'point-counterpoint' articles were presented on both sides of the coal issue. On the pro coal side, Doug Roberts Jr. director of environmental and energy policy at the Michigan Chamber of Commerce, and MICHAEL JOHNSTON vice president of government affairs at the Michigan Manufacturers Association opined that coal offers reliable, affordable power. Weighing in on the Governor's State of the State proposal to move Michigan toward green energy, the Free Press stated in an editorial that a ban on coal plants was in the best public interest. Michigan members of the House of Representatives have been identified as some of the leading recipients of campaign contributions from the Coal Industry. John D. Dingell (D-MI), until November, 2008, Chairman of the Energy and Commerce Committee,received $129,000 in coal contributions during the 110th congress while representing district 15. Dave Camp, a Republican representing the 4th District, which includes Midland, received $27,649 in coal contributions during the 110th congress. Mr. Dingell was replaced in his Energy and Commerce post by California's Henry Waxman in the fall of 2008. In October 2008, researchers at the University of Michigan announced they had developed a tool that uses natural "fingerprints" in coal to trace the source of mercury emissions in the environment. The new method is expected to distinguish mercury pollution caused by coal plants from that caused by other industrial activities, as well as to differentiate between different coal deposits. The researchers hope to be able to detect mercury coming from specific coal plants in the United States, and track the movement and deposition of mercury produced by coal plants overseas. The group believes that the tool will be useful in analyzing the potential environmental impacts of the numerous coal plants currently proposed in Michigan. A new EPA study sheds more light on the contributions of coal fired power plants to toxic build-up in Great Lakes Fisheries. According to the study, Mercury concentrations in game fish exceeded the EPA’s recommended levels at 49% of lakes and reservoirs nationwide. Burning fossil fuels, primarily coal, accounts for nearly half of mercury air emissions caused by human activity in the U.S.
14th biggest coal energy company in U.S. Owner of Detroit Edison Co.
31st biggest coal energy company in U.S.
Michigan is 10th in the nation in coal power generation, with 88 operating coal-fired power at 33 locations totaling 12,891 megawatts (MW). 49 of these units are larger than 50MW. In August 2010 a study released by the Environmental Integrity Project, the Sierra Club and Earthjustice reported that Michigan, along with 34 states, had significant groundwater contamination from coal ash that is not currently regulated by the Environmental Protection Agency (EPA). The report, in an attempt to pressure the EPA to regulate coal ash, noted that most states do not monitor drinking water contamination levels near waste disposal sites. The report mentioned Michigan based Whiting Generating Plant as having groundwater contamination due to coal ash waste. Michigan has no major coal mines. A 2011 report by the Michigan Public Service Commission, "Report on The Implementation of The P.A. 295 Renewable Energy Standard and the cost-effectiveness of the Energy Standards," found the levelized cost of new coal to cost $133/MWh, while the cost of levelized renewable energy is $98.68, without accounting for the external costs of coal. On December 2, 2011, Consumers Energy announced that is was cancelling the proposed 800 megawatt Karn/Weadock Generating Complex Expansion because of "reduced customer demand for electricity due to the recession and slow economic recovery, surplus generating capacity in the Midwest market, and lower natural gas prices linked to expanded shale gas supplies." In addition, the company announced that it was suspending operations by the end of 2014 at seven existing generating units, included two units at the Whiting Generating Plant, two units at the Cobb Generating Plant, and two at the Karn Weadock Generating Complex. The company reported that it began construction in November 2011 of its first wind farm, the 100 MW Lake Winds Energy Park, in Mason County. Consumers Energy is also developing the 150 MW Cross Winds Energy Park in Tuscola County. ↑ Magnitude and Quality of Michigan's Coal Reserves, OFR - 102 - 76 U.S. Bureau of Mines Open File Report, 1977. ↑ Coal Resources in the Michigan Basin: Some Suggestions for Development, Aureal T. Cross, October 2002. ↑ Mining in Michigan, National Mining Association, accessed June 2008. ↑ "The Facts", America's Power, accessed June 2008. ↑ "Texas, Wyoming lead in emissions", USA Today, June 2, 2007. ↑ Supporters Call fro Policies to Fuel Jobs"Barbara Wieland, The Lansing State Journal, July 30, 2009"
↑ Michigan to Granholm: We Want Clean Energy"Bruce Nilles, The Daily Kos, July 30, 2009"
↑ Coal opponents rally for green jobs, seek momentum in fight against new power plants"Eartha Melzer, The Michigan Messenger, July 29, 2009"
↑ Stop the Michigan Coal Rush"Sierra Club Michigan Chapter, July, 2009"
↑ “CEI Sues the DEQ”, Citizens for Environmental Inquiry, accessed August 2008. 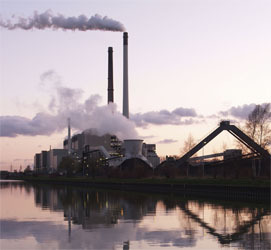 ↑ “Study Questions Financial Impact of Rogers City Coal-Fired Power Plant”, alpenanow.com, May 14, 2008. ↑ “Study Explodes Cheap Coal Myth”, MidlandCARES, January 21, 2008. ↑ MidlandCARES.org, accessed August 2008. ↑ "Sierra Club sues DeYoung power plant in Holland over emissions," The Grand Rapids Press December 15, 2008. ↑ "Pet Coke: The New Coal?," Michigan Land Use Institute, December 22, 2008. ↑ Jacqui Patterson, "Day III Clearing the Air Road Tour — River Rouge, MI — River Rouge Power Plant," NAACP Climate Justice Initiative, April 21, 2010. ↑ "The Coal Fields of Bay County," Michigan Family History Network, accessed October 2008. ↑ "Great Lakes Ports and Shipping," TEACH Great Lakes, accessed October 2008. ↑ Study: Shipping goods on Great Lakes still the best way"Jeff Alexander, The Muskegon Chronicle, March 20, 2009"
↑ Great Lakes Ports and Shipping: Cargoes - Iron Ore and More, teach.GLIN.net, accessed December 2008. ↑ "Granholm Pushing State to Produce More Alternative Energy", Mlive.com, December 11, 2007. ↑ Senate Bill 0213, Michigan Legislature, accessed October 2008. ↑ "Electric Energy Changes to Hike Rates $2 to $2.8 Billion," Office of the Attorney General, March 11, 2008. ↑ "Renewable Portfolio Standard passes, not everybody's happy," Business Review Western Michigan, September 18, 2008. ↑ 28.0 28.1 "State energy bill will hit consumers hard," Detroit News, September 10, 2008. ↑ Feed In Tariffs:Ontario's Experience"John Lorinc, The New York Times, February 10, 2009"
↑ Feed In Tariffs, Solar Boon or Boondoggle? "CoolerPlanet, July 28, 2009"
↑ NREL Analysts Dig into Feed-In Tariffs"NREL News, June 12, 2009"
↑ Power plan would promote renewable energy"Emily Lawler, The Great Lakes Echo, November 8, 2009"
↑ Co-op Study Attacks Jobs and Homegrown Energy Bill"Glenn Puitt, Great Lakes Bulletin News Service,November 11, 2009"
↑ "Mich. Senate makes last-minute effort to change rules for coal plants," Michigan Messenger, December 18, 2009. ↑ Staff, "Michigan Counties Population changes" 'Northwest Michigan Council of Government. ↑ Michigan Brief 2008 No. 3, Comerica Bank, July 25, 2008. ↑ Comerica Bank, Michigan Economy Hits 8-Year Low, Comerica Bank, May 22, 2008. ↑ "Michigan jobless rate: 10.6%" Detroit News, January 22, 2009. ↑ Amy Lane, "Lower Electricity sales cited in energy reform debate" Crain's Detroit Business, August 11, 2008. ↑ "Officials: Power plants still a go despite economy," Bay City Times, November 13, 2008. ↑ "Surprise Drop in Power Use Delivers Jolt to Utilities," Wall Street Journal, November 21, 2008. ↑ Electricity Prices Plummet"Rebecca Smith, The Wall Street Journal, August 12, 2009"
↑ http://www.wwj.com/pages/4993400.php? Report: Renewables and Energy Efficiency Are Enough to Power the State]"Great Lakes IT Report, August 12, 2009"
↑ 51.0 51.1 Rebessca Smith, "Surprise Drop in Power Use Delivers Jolt to Utilities", Wall Street Journal, November 21, 2008"
↑ Costs to adhere to pollution rules will lead to higher rates, Consumers Energy says<"Chris Gautz, Jackson Citizen Patriot, November 27, 2009"
↑ 53.0 53.1 Nikki Younk, "Electric Rates to Jump," Iron Mountain Daily News, July 3, 2009. ↑ METRO Coal plants a fiery issue "Detroit News, January 7, 2009"
↑ Activists Opposed Coal Plant in Northern Michigan "Associated Press, January 7, 2009"
↑ Granholm, DEQ Urged to Stop Coal Plants "Lansing City Pulse, January 6, 2009"
↑ Should coal play role in state's energy future? 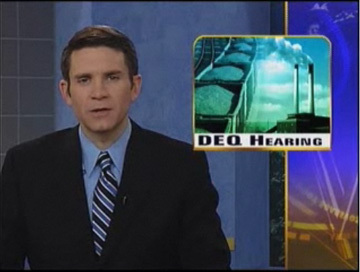 "WJRT-TV, January 7, 2009"
↑ Environmentalists Calling on Granhom "WNLS TV 6, January 6, 2009"
↑ Some Northern Michigan Residents Against Coal Plant "TV 25, January 6 2009"
↑ Proposed coal power plant hearing "Channel 29.8, January 7, 2009"
↑ Say No to New Coal Power Plants "Detroit Free Press, January 9, 2009"
↑ Rush to Coal Could be Hazardous to Michigan "Howard Hu and Kenneth Rosenman, Detroit Free Press, January 6, 2009"
↑ Don't bar coal from state's energy future "The Detroit News, January 8, 2009"
↑ Mileage from megawatts: Study finds enough electric capacity to "fill up" plug-in vehicles across much of the nation "US Dept of Energy PNNL, December 11, 2006"
↑ Follow the Coal Money, accessed October 2008. ↑ "Democrats Oust Longtime Leader of House Panel," New York Times, November 20, 2008. ↑ EPA study shows toxic chemicals in fish tissue from lakes"Waste and Recycling News, Nov. 11, 2009"
↑ Power Plants in Michigan, Powerplantjobs.com, accessed June 2008. ↑ Existing Electric Generating Units in the United States, 2005, Energy Information Administration website, accessed May 2008. ↑ Major U.S. Coal Mines, Energy Information Administration, 2006. ↑ Orjiakor N. Isigou, Monica Martinez, and Greg R. White, "Report on The Implementation of The P.A. 295 Renewable Energy Standard and the cost-effectiveness of the Energy Standards," Michigan Public Service Commission Department of Energy, Labor & Economic Growth, Feb. 15, 2011. This page was last edited on 4 December 2017, at 04:48.